Really a Good news for Paypal merchants, Exporters and Freelancers who use paypal as their gateway to recieve funds. 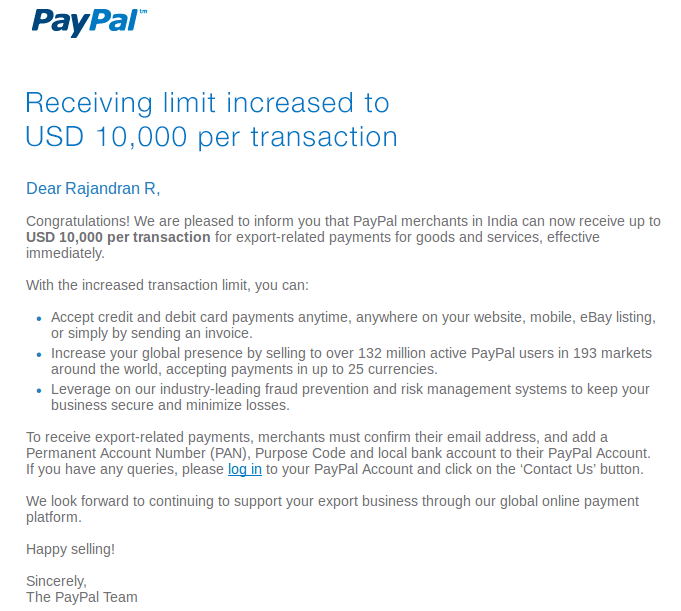 According to the latest notification from paypal, Indian paypal users can now receive upto a maximum of 10000 dollars in one transaction.Earlier there is a restriction to recieve money upto USD 3000 limit and now it has been revised to 10,000 dollars. Today got a notification from Paypal stating that my reciving limit has been revised from USD 3000 to USD 10,000. Snapshot shown below. Earlier Reserve Bank of India has issued notification RBI/2012-13/528, which notifies that receiving limit for export related remittances for PayPal India has been increased from $3000 to $10000, during 11th June 2013. However Paypal takes little time to announce as per the RBI circular. Please refer the RBI circular. RBI had issued circular long back and its takes paypal a couple of days to implement the same. Iam tracking it very closely. Check out the online version of paypal communication here. Cant be a fake one.